Real Estate in Kelowna is a competitive business. There are a lot of very good realtors in the valley and with housing prices climbing the quality of the services they offer are under greater scrutiny from buyer and seller alike. Real Estate agents need to not only have excellent sales skills and a strong network they also need exceptional marketing tools to support their services. 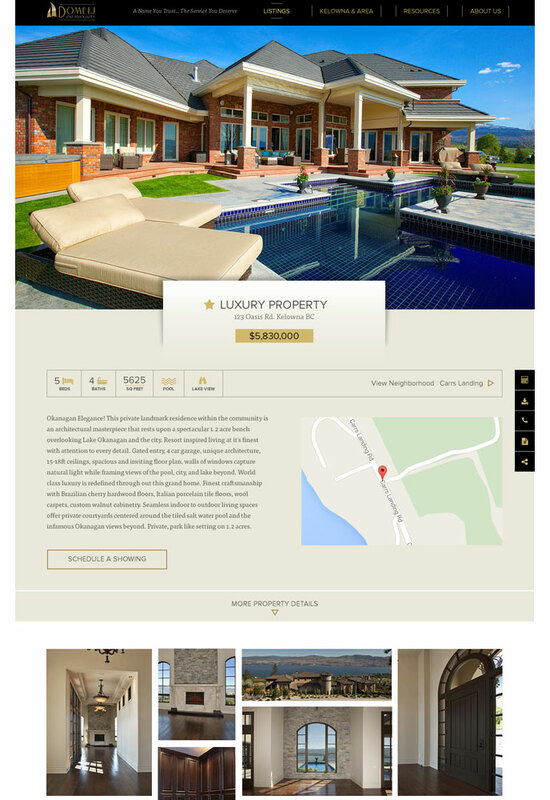 A professional website is a must for top agents, especially in the luxury real estate market. If you don’t have a professional site you’re not offering the best products and services that homeowners are demanding. Dave and Jason Domeij are two of the top Realtors working in Kelowna today. When they came to Spincaster looking for a redesign they had specific goals they needed to accomplish with their new real estate web site. We also identified that we needed to raise both the quality of design and attention to detail of the site to better compete with their competitors in the luxury real estate sector. Spincaster has worked with Dave Domeij & Associates for many years and there was a strong trust in our ability to design a new website that would meet their criteria in a beautiful and effective way. One of the primary challenges was to provide all of the details on the property while keeping an emphasis on the photography. We did not want to show an MLS listing page with the boilerplate stats provided from CREA. Instead, we wanted to showcase the architectural photography to help sell the property and work towards a conversion with strong calls to action. Focusing on the user experience and aesthetic first have worked extremely well to put the new site a cut above their competitors and to provide the users with the best experience possible. The layout and style of the new Dave Domeij & Associates website is very clean and modern. It builds on the original colors from Dave and Jason’s previous brand guidelines but brings them to a modern standard. There was a clear design purpose with large, clear images used throughout the site. We wanted to create a virtual representation of “Curb Appeal” with big hero images and extensive use of photography on the website. Most realtors rely solely on the MLS OMREB information to populate the listing section of their websites. We purposefully created a custom Homes Listing Section using custom fields in the WordPress CMS. This allowed us to build our own filters and home feature section. This also provided a much more control over the information about the property. With an impressive gallery we could provide the basic details on the house and then allows the user to toggle for more information if required. 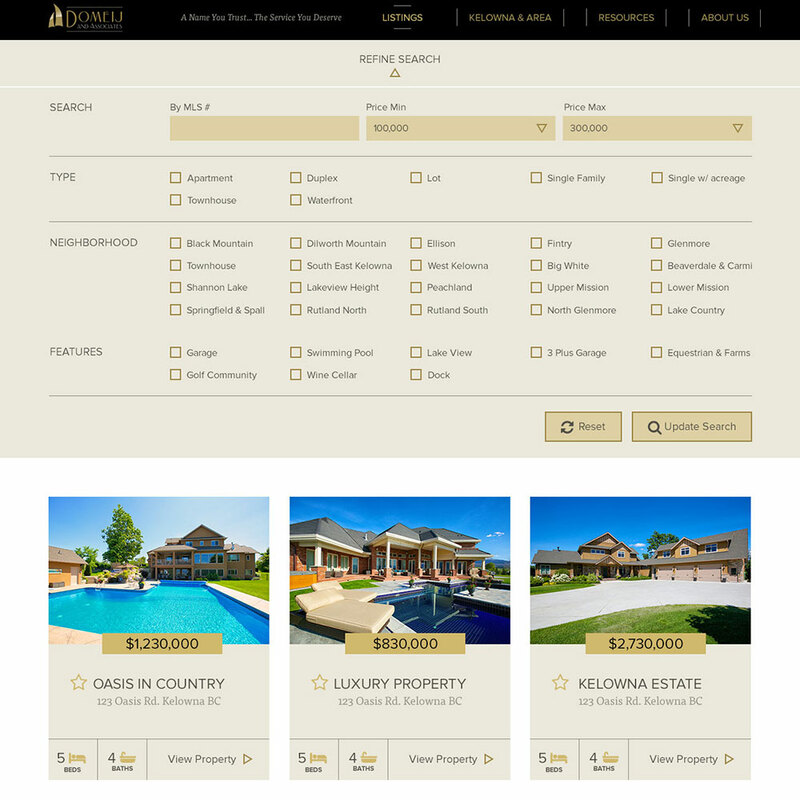 This builds a truly impressive feature page for the luxury home. Having full control of the information about the homes also allowed us to build a custom filter on the web site which provides the user with a quick and simple way to search all of the properties listed. 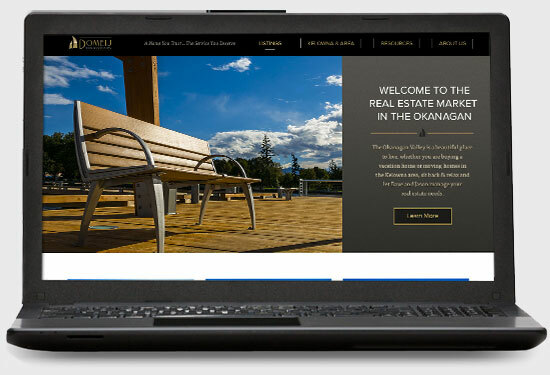 The new site is truly one of the best Real Estate websites in the valley, thanks to our deep understanding of the industry and what works well for Real Estate websites. The freedom and trust that Dave and Jason gave us in developing out the final solution really show in the final web site.